A comprehensive account and frank assessment of federal involvement in education is long overdue. 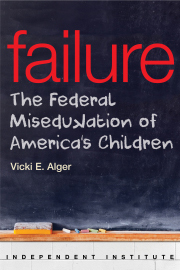 Education policy expert Vicki E. Alger remedies this deficiency with her forthcoming book, Failure: The Federal Misedukation of America’s Children (Independent Institute, 2016). Created in 1979, after a lobbying campaign that spanned generations, the Department of Education has failed to live up to its promises. Federal involvement—whether related to testing, funding, or academic curricula—has failed to abide by the Constitution’s implication that education must remain the domain only of state and local governments and private institutions. Most of all, the central government’s pervasive meddling in education has failed America’s school children and their parents. Education policy has long been mired in controversies, often with opposing sides missing the mark. Failurehelps us step back from the skirmish du jour and redirects our focus to the big picture, showing us what’s gone wrong over the decades and the institutional causes of these failures. It also offers a bold blueprint for returning the federal government to its constitutional role and for cultivating an educational system that meets the needs of students and parents, rather than bureaucrats. Concerned citizens of every stripe will benefit from Failure’s history of federal education policy, its brutally honest report card for the Department of Education, its look at education systems across the globe, and its ambitious policy recommendations. Failure might even succeed in reframing the way the federal education establishment thinks about education policy.